This show appeals to everyone who’s fascinated by theatre, to anyone who wants to know what it feels like to be a professional actor. 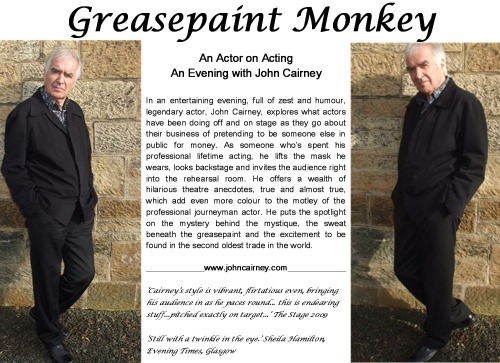 In an entertaining evening, full of zest and humour, legendary actor, John Cairney explores what actors have been doing for almost three thousand years as they go about their business of pretending to be someone else in public for money. He shows us the actor’s view of his own world, of the audience, of critics, and of colleagues past and present. As someone who’s spent his professional lifetime acting, he lifts the mask he wears, looks backstage and invites the audience right into the rehearsal room. In this show, the greasepaint monkey lubricates the engine of the imagination, turns the wheel of thought and adjusts the brakes of disbelief to create a live theatrical experience. He offers a wealth of hilarious theatre anecdotes, true and almost true, which add even more colour to the motley of the professional journeyman actor. He puts the spotlight on the mystery behind the mystique, the sweat beneath the greasepaint and the excitement to be found in the second oldest trade in the world.